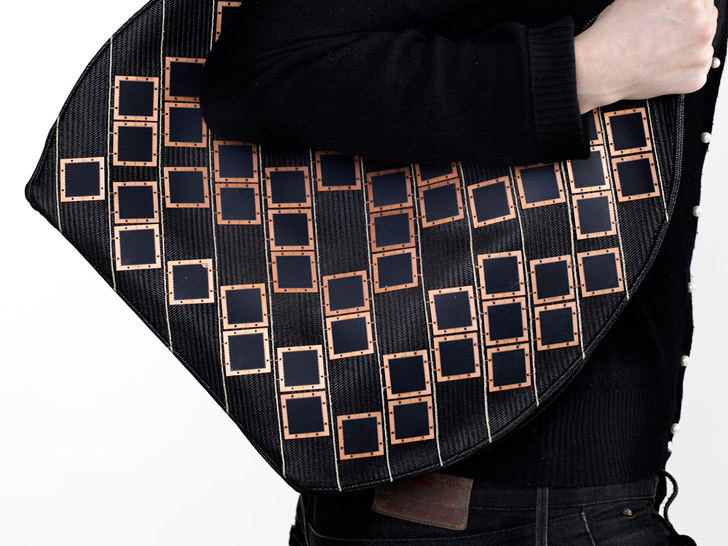 Diffus, the interactive design firm that brought you the environment-sniffing “Climate Dress,” has unveiled its latest project: a glittering, luxe solar-powered handbag that uses miniature photovoltaic cells as a design element rather than something to be camouflaged. With the help of Swiss embroidery company Forster Rohner and the Alexandra Institute, Diffus wired 100 tiny solar panels onto the bag’s exterior—enough to generate juice to power your cellphone or other mobile device. Opening the bag also activates fiber optics integrated inside, so finding your keys at night is a snap. The sturdy black carryall, amply sized to hold all your daily load, makes solar power a chic statement with its copper-framed solar cells and artfully exposed wiring. Hanne-Louise Johannesen, the company’s co-founder, compares the seamless marriage of function and design to the work of architect Gustave Eiffel. The sturdy black carryall makes solar power a chic statement with its copper-framed solar cells and artfully exposed wiring. Unlike most solar textiles, which are limited by their comparatively small surface area, Diffus’ caryall is based on shrinking down the most efficient photovoltaic materials currently available—monocrystalline silicone—into oversize sequins for a greater expanse. Exposed to sunlight, the tote is able to generate 2 watts, a number that will only increase as future solar elements double or triple in efficiency. Diffus, the interactive design firm that brought you the environment-sniffing "Climate Dress," has unveiled its latest project: a glittering, luxe solar-powered handbag that uses miniature photovoltaic cells as a design element rather than something to be camouflaged. 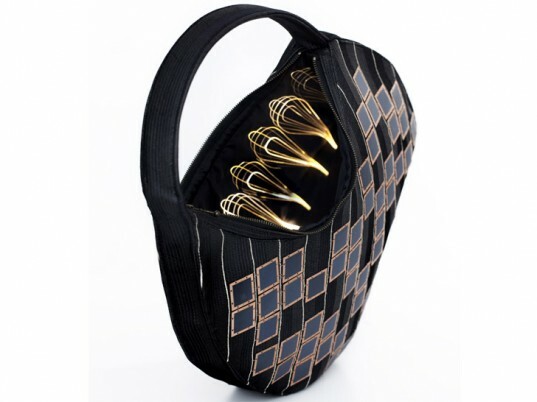 With the help of Swiss embroidery company Forster Rohner and the Alexandra Institute, Diffus wired 100 tiny solar panels onto the bag's exterior�enough to generate juice to power your cellphone or other mobile device. Opening the bag also activates fiber optics integrated inside, so finding your keys at night is a snap.